The National Space Society (NSS) has congratulated SpaceX on the first flight of the Falcon Heavy (FH). NSS believes that the first flight of the FH is an important step toward achieving Milestone 2: Higher Commercial Launch Rates and Lower Cost to Orbit in the NSS Space Settlement Roadmap . According to NSS Senior Vice President Bruce Pittman, the FH will enable concept studies such as the Evolvable Lunar Architecture to become a reality, allowing the U.S.A. to return to the Moon within the current NASA budget ,while maintaining a balanced space program, including a gapless transition to future LEO commercial space stations and robotic exploration of the solar system. NSS members look forward to seeing NASA join the U.S. military in making use of the commercially competitive FH, now the most capable rocket currently flying." 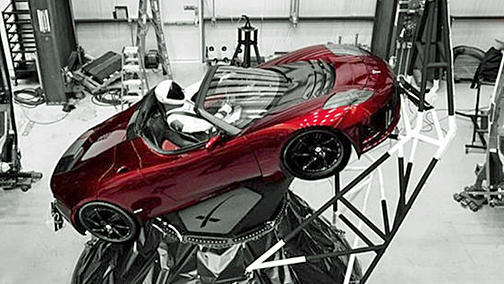 Elon Musk's Tesla, which is now en route to Mars, courtesy of the SpaceX Falcon Heavy launch on February 7, 2018. Later in the evening of February 3, a final burn blasted the Tesla and its "driver" on a path toward Mars and the asteroid belt. In addition to being really cool, this mission profile demonstrates the ability of the FH to launch large satellites directly to geosynchronous orbit after significant coasting periods. During the coast interval, SpaceX released live video via the Internet of the Tesla circling the Earth. Dale Skran, NSS Executive Vice President and Chair of the NSS Policy Committee, noted that SpaceX achieved a lot of firsts — the FH was successfully boosted off the pad with 27 engines firing simultaneously, a new record for the U.S.A. Additionally, he noted that the return to launch site of two side boosters has never been done before. Most importantly, the FH opens an era of lower launch costs that will enable a wide range of new endeavors in space, including an affordable return to the Moon. 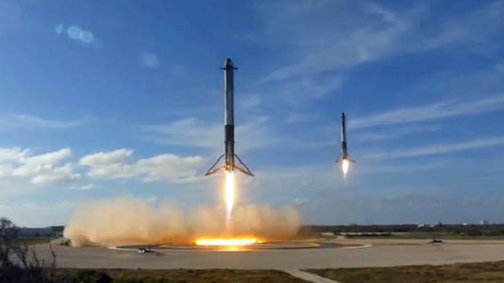 Two of SpaceX Falcon Heavy's side boosters re-landing at the launch site. Space Solar Power expert and member of the NSS Board of Directors John Mankins added that the reduction in launch costs that will be achieved with the FH was not just unrealized ten years ago, it was actually characterized as impossible by leading aerospace engineers. The targeted prices that SpaceX promises with the FH — below $1,000 per pound — will be a breakthrough moment in the realization of ambitious future space business sectors such as Space Solar Power.